We made this card at our recent Team Get-together. This is the simple version, using just stamps, ink and paper. It's a versatile card that would work for just about any occasion if you changed the sentiment to suit. The layout would work with many different stamp sets and Designer Series Papers too. 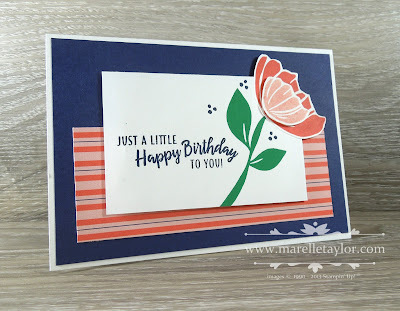 This simple version is perfect for beginner stampers, or those who don’t own a Big Shot, or even the more experienced of us who just need a quick no-fuss card. You could use any sentiment (I used one from the Made to Bloom All-inclusive Kit). My colour combo is Night of Navy, Calypso Coral and Call me Clover (love these together!). I stamped off the smaller flower to get the lighter shade. Next time I'll show you the stepped up version. Thanks for stopping by!